This marine snail has a thick, strong, dull grey to brownish-grey shell that reaches 5 cm long. The shell is marked by 9-11 low, evenly-spaced ribs running along the length of the spire (in smaller individuals these ribs may extend into the main body whorl) and many thin, unevenly-sized spiral lines. These lines create a somewhat striped appearance, and can be seen very clearly on the inside lip of the aperture (opening). The aperture takes up more than half the shell's length. The body of the animal is white. 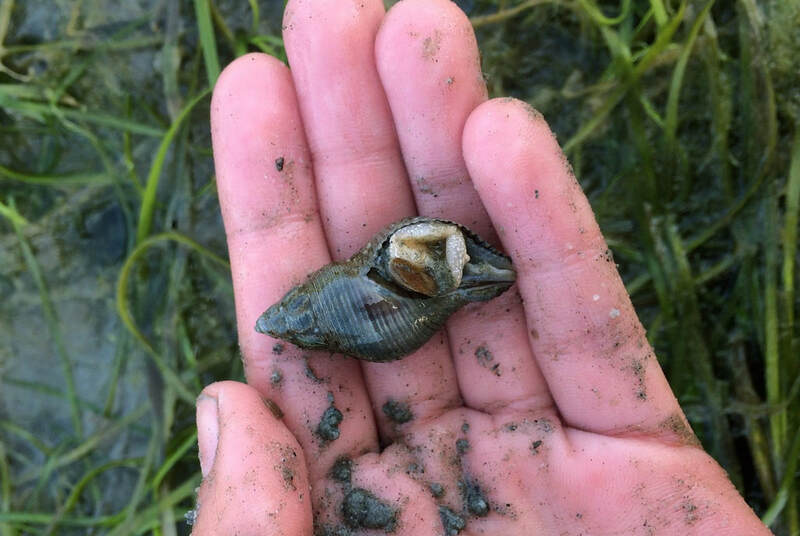 The dire whelk is found in the rocky intertidal of exposed beaches, as well as on rocks in muddy and gravelly beaches, to a depth of 35 m. Its range extends from northern Alaska to southern California. It is abundant in the middle of its range, in British Columbia, Washington, and Oregon, and less so in Alaska and California. The dire whelk is a scavenger that also preys on injured animals, including limpets, chitons, barnacles, and worms. It eats larger dead animals as well, such as crabs and fish. It can extend its proboscis the length of its shell in order to digest sedentary worms (such as the calcareous tube worm) in their shells. Adams, M.J. (2005). Lirabuccinum dirum (Dire whelk). Beach Watchers. Washington State University. Accessed 10/11/2014. Cowles, D. (2005). Searlesia dira (Reeve, 1846). Invertebrates of the Salish Sea. Rosario Beach Marine Laboratory. Accessed 10/11/2014. Harbo, R. M. (2011). Whelks to whales: Coastal marine life of the Pacific Northwest [revised]. Madeira Park, BC: Harbour Publishing. P. 146.